Pumpkin is rich in nutrients and abundant in the fall. Whether you puree your own or buy canned, you can enjoy pumpkin in a variety of dishes. Canned pumpkin puree (Not pumpkin pie filling!) makes this cake a hasty tasty quick bread. I use the Vitamix to make the batter, but a mixer works, too. The maple glaze is optional. Spray inside of a 8½” X 4½” loaf pan or a small tube cake pan with cooking spray. In a 2 quart mixing bowl or pitcher, combine all dry ingredients. Form a depression in the center. Set aside. In the Vitamix container (or a mixing bowl) combine the pumpkin and Egg Beaters® starting at Variable Speed 1. Gradually increase speed to 10 then High. Run for 20 seconds. Add the wet ingredients to the center of dry ingredients and fold using a spatula or spoon. Don’t over mix. Batter will be stiff. Spoon batter into the loaf pan and place in the oven. Bake for 25-30 minutes or until a toothpick inserted comes out clean. Remove cake from pan and cool on a rack, at least 30 minutes. In a small plastic food storage bag, combine powdered sugar and real maple syrup. Seal bag then snip a hole in one corner to create a small piping bag. Drizzle the cake lightly with the glaze and serve. Variations: If you prefer a less dense cake, use 1 cup whole wheat flour and 1 cup all-purpose flour. Add ½ cup nuts for more fiber and flavor. Note: Cake will be dense and moist. I enjoy a muffin, but often they are dense and heavy. If I splurge and indulge, I want a yummy and light treat. After experimenting with recipes, I settled on one that we love. The extra baking powder makes them light and airy. Don’t be alarmed at the amount of butter. Spread over twelve servings, it’s not too decadent yet adds flavor. Or substitute coconut oil for the butter. It works. One muffin won’t wreck your daily calorie count. One. Preheat oven to 375 F. Spray the cups of a muffin pan with cooking spray. Pour liquid ingredients into the dry. Whisk just until batter is smooth. Don’t over-beat. Set aside. Fill each muffin cup with batter just shy of halfway. Add 1 tsp. 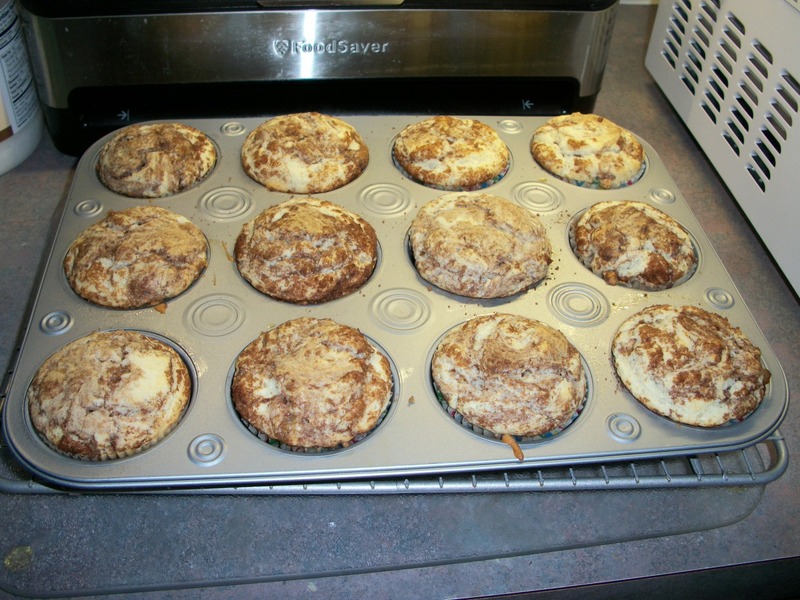 cinnamon-brown sugar mixture to each muffin. Layer 1 Tbsp. batter followed by 1 tsp cinnamon-brown sugar mixture. Using a knife or skewer, swirl batter with the cinnamon-brown sugar. Place muffin pan on the center rack of oven. 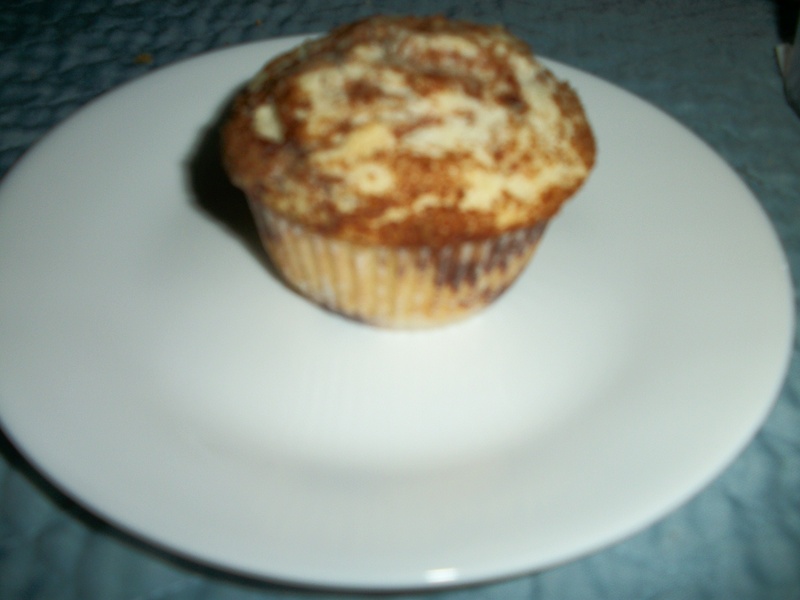 Bake for 20 minutes or until a toothpick inserted in a muffin tests clean. Remove muffins and cool on a rack. Light and airy, cinnamon swirl muffins are perfect for breakfast or anytime. Apologies to my gluten-intolerant friends. I failed at making a gluten-free version of this recipe, but I’ll keep experimenting in my lab–, er, kitchen.